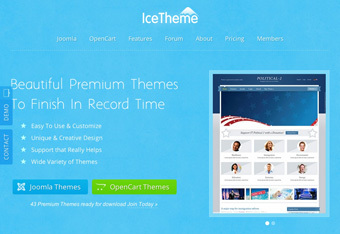 IceTheme restaurant templates will let you create a professional, great looking website even if you aren’t a skilled web designer. Some minor coding knowledge is all it takes for you to quickly get a website for your restaurant up and running all by yourself. These templates are functional, carefully created and they feature many custom extensions created by the developer in order to help you make your website look and function the best way possible. InkThemes is a professional WordPress development firm, specializing in WordPress themes. They currently offer 34 full themes, and they are constantly adding new themes to the library. 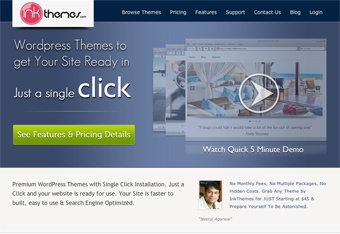 All of the themes sold by InkThemes are designed and developed by their in-house staff. InkThemes is dedicated to producing and selling high quality, aesthetically pleasing, fully functional WordPress themes for business owners, bloggers, and anyone who wants to build a website without the hassle of hand-coding everything. 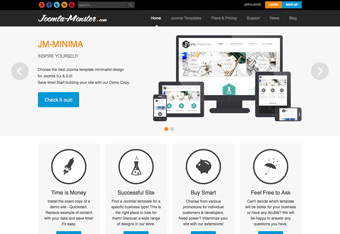 Joomla Monster is a serious developer who offers high quality templates that aren’t only great looking, but very easy to manage as well. Creating a professional website is a piece of cake with these templates. With all the great options added specifically for restaurant website, you will get everything you need if you choose one of their templates. The great customer support this developer offers guarantees to help you with any question you might have. Mojo Themes is a theme marketplace that allows designers and developers from all walks of life to sell their goods in a regulated but open marketplace. 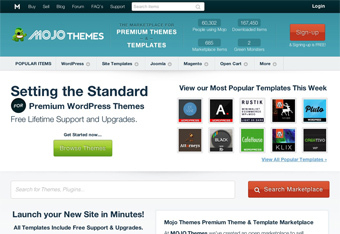 At Mojo you can find a variety of WordPress, Joomla, and HTML templates and themes. And since there are so many different developers selling on this one website, competition keeps the price down, AND there is a ton of content to chose from! With Mojo Themes, the customer truly gets the best of both worlds!